“Macro & Nano dimensions in one single process unit, opening up a whole new dimension in the mimicking of complex bio-architectures: bio-architectures comparable to those found in nature”For 10 years regenHU has dedicated its engineering skills to assisting the scientific community with their cutting-edge bioprinting solutions. Benefiting from a unique network of global partnerships with leading scientific innovators and industrial players, we are constantly at the forefront of innovation. So, together with our scientific partners, we are particularly privileged to announce today that we have achieved a significant breakthrough in biofabrication; a breakthrough through the convergence of two key biofabrication technologies Bioprinting & Electrospinning in one single process unit. “Macro & Nano dimensions in one single process unit, this is enabled with the 3DDiscovery™ Evolution. 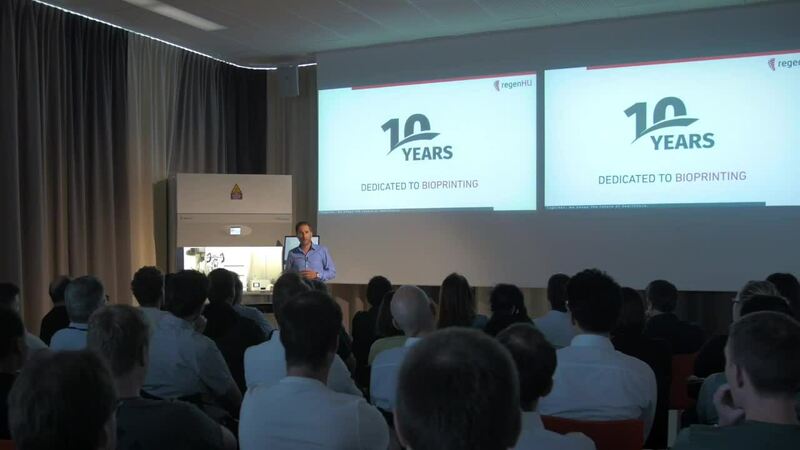 A powerful tool which creates tissue architectures comparable to those found in nature” announces Marc Thurner, regenHU’s CEO With great interest the 3DDiscovery Evolution was show cased on May 24 during the Innovation Day at Le Vivier in Switzerland.